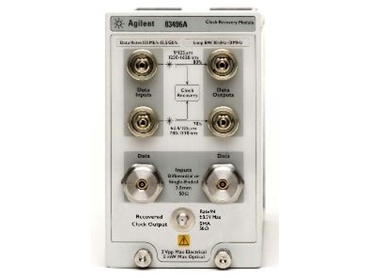 AGILENT Technologies has introduced the 83496A multi-rate optical/electrical clock recovery module for the Agilent 86100C Infiniium digital communications analyser (DCA-J). The single, plug-in module performs clock extraction for waveform analysis with continuous, unbanded tuning from 50Mb/s to 13.5Gb/s, ultra-low residual jitter and Golden PLL (phase locked loop) operation. Now optical and electrical component and system designers in high-speed digital communications can achieve higher measurement accuracy and increased performance margins in industry-standard compliance testing. In today's competitive environment, it is critical to avoid obscuring true product performance caused by inadequate instrumentation. The 83496A is not only a tool to extract a timing reference, but an essential element in a compliant test system. With the widest range of telecom/datacom transmission rates and lowest intrinsic jitter in the industry, the 83496A will provide the necessary test-system flexibility as new rates emerge. The 83496A was developed in close collaboration with Agilent Labs -- Agilent's central research organisation -- and Agilent's test and measurement business. It is the industry's first clock recovery module with the necessary accuracy for high-speed waveform analysis at any data rate. Its continuously adjustable loop bandwidth from 30kHz to 6MHz makes the 83496A suitable for jitter compliance tests across a wide range of industry standards. The 83496A can function as a Golden PLL by setting the loop bandwidth to the exact value required for any data rate within its operating range, making it a key component for standards-compliant jitter tests. Its ultra-low jitter performance removes the limitations of traditional test equipment, allowing designers to measure the true jitter of devices. * Continuous unbanded tuning from 50 Mb/s to 13.5 Gb/s (and any rate in between) provides ultimate flexibility and value in one plug-in module. * Less than 300 femtoseconds rms jitter results in negligible residual jitter of the output clock and precise measurements of very low levels of signal jitter. * Tunable loop bandwidth from 30kHz to 6MHz allows configuration as a Golden PLL with optimal loop bandwidth for accurate, industry-standard compliance testing.